With your idiot box could do more than flick through broadcast TV channels? We rounded up media players and smart TVs that get your digital media, streaming video services, YouTube, and web content into the lounge. If you own any sort of digital media be it movies, music or photos by now you’ll probably have heard of media players. The main utility of media players is, as the name implies, playing digital media on your TV. Note that this doesn’t necessarily mean storing your media as well though some media as well though some media players come with built-in herd drivers, the majority don’t. They all have network connectivity and USB ports. These give you access to either media stored on your home network on a PC or NAS drive, or a connected USB hard drive, for playback of stored material. Video and audio is sent to your TV or home theatre system, and you get a remote control for browsing all your digital content, playback controls system settings and so forth. You might already have some of this functionality much as plain old mobile phones are supplanted by smartphone, televisions have been going through a transformation into so-called “smart TVs”. The most common implementation of smart functionality uses apps programs that either come preinstalled on the device or are downloaded from an online marketplace. Examples include Skype, news and weather feeds. It’s also common for smart TVs to have an internet browser so you can surf the net just like on a regular PC. It is not just about web access though arguably the more important feature of smart TVs is how they can connect and interface with other devices in your home. Take Digital Living Network Alliance (DLNA) support for example some smartphones also support this technology, allowing you to instantly stream movies, music and photos to your DLNA-enabled TV from those devices. Steaming content services, such as Quickflix, are also appearing on the humble telly: you can pay to instantly stream some of the latest movies and shows straight to your TV. We checked out five current New Zealand-available media players and four smart TVs, to see which offer the best “smart” media experiences. Two years ago we reviewed the A.C Ryan Playon!HD Mini media player. We liked it so much that we rated it 9 out of 10. This month we have a new, bigger model from A.C. Ryan called the Playon! HD2. It’s available in NZ stores for around $199 (RRP $229). The shiny, black Playon! HD2 is quite big for a media player, thanks to the inclusion of an internal 3.5-inch hot-swap drive bay. That allows you to slot in your own hard drive- no drive is included in the purchase price. If your media is stored on a PC, you could transfer it to a 3.5-inch SATA hard drive, put that drive into the Playon!HD2, and have instant access to that data on your TV. If you don’t fancy cracking your PC open to swap drives in and out, then you could simply put a new hard drive into the unit and transfer files from a PC via the supplied USB 3.0 cable. Along with the USB 3.0 port you also get two USB 2.0 ports that connect devices such as portable hard drives, keyboards and wireless dongles. Speaking of which, the wireless dongle is an optional extra which sells for $49. Products priced similarly to the Play on! HD2, like the Western Digital WD TV Live, come with built-in Wi-Fi adapters, so A.C.Ryan loses points for this in our books. 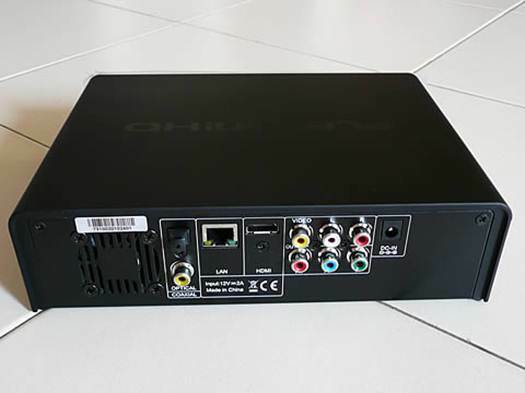 There’s wired Ethernet port for a standard LAN connection, plus HDMI, component and composite video outputs for connecting to your TV. Digital audio is provided via both optical and coax outputs. I hooked up the Play on! HD2 to my 1080p Plasma telly and found that the user interface has been completely redesigned since the older Mini-series. The remote has an excellent layout, and the entire thing looks great and is easy to navigate. However, there’s a noticeable lag between pressing a button on the remote and the corresponding action on screen. This might not be a deal-breaker for most people but I found it very frustrating. File support was excellent, just like the previous A.C. Ryan unit, and all the standard- issue internet apps such as Facebook, You Tube, Shoutcast and Picasa were present. The feature that killed the Playon!HD2 (literally) was YAMJ – ‘Yet Another Movie Jukebox’. In theory, you connect the unit to your PC, run the YAMJ client, and it will download meta data for your media: movie artwork, synopses, and critic ratings. Sounds great, right? In reality, the YAMJ client is the worst program I’ve ever had the displeasure of using. The graphical menu gives only the most basic of library location options, everything else is controlled via either command line interface or manual editing of configuration files. What’s worse is that after running the client and trying to access the jukebox on the television, the unit froze and wouldn’t restart. Not even a hard reset would bring it back to life. Looking at user comments online it appears I’m not the only one to encounter this problem. Even assuming A.C. Ryan fixes this catastrophic bug in a update, the Playon! HD2 is a pretty average media player. The internal drive bay is a cool feature but the menu system needs some serious performance tuning, and including a wireless adapter wouldn’t hurt.